The Indian division of the American manufacturer, Ford Cars, is expected to launch the much awaited EcoSport in the coming weeks. 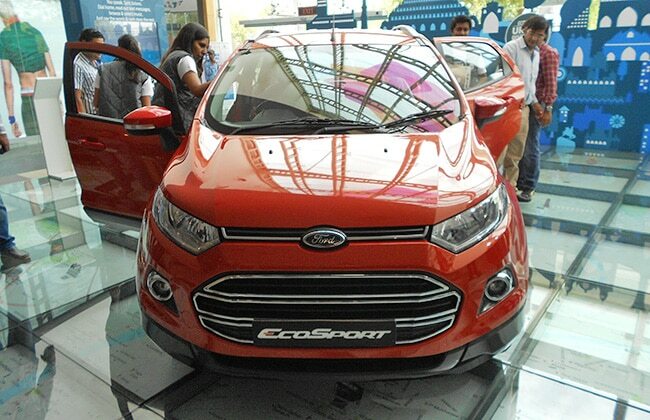 Ford EcoSport will be released in three different engine varieties. Consumers get to choose between a 1.5 liter petrol engine, a 1.5 liter TDCi diesel engine and a 1 liter turbocharged eco boost engine. The 1.5 liter diesel engine gives a remarkable mileage of 22.7kmpl. The petrol engine can give a power output of 110bhp at a torque of 140Nm. The EcoBoost engine’s capacity might be less, but it is expected to give the driver with power and torque similar to a traditional 1.6 liter petrol engine. The ecoBoost engine utilizes up to 20% lesser fuel than traditional engines. The three cylinder petrol engine can deliver a great power and reach up to a full torque at just 1500 rpm. This engine is coupled with a five speed manual transmission gearbox and can provide 122.5bhp at a torque of 170Nm. The ecoboost engine is also expected to provide 18.9 kmpl mileage. The SUV will perform well on most terrains with the capability to cross waters up to 550mm height and a ground clearance of 200mm. The Ford EcoSport features have been revealed and it is anticipated that the SUV will be released in four trim levels. Ford EcoSport Price is expected to be in the range of 650000 for basic models and can go up to 1250000 for the model equipped with all features Ford has to offer. The basic trim level ambiente will sport either the petrol or diesel engines. It comes with some plain features like Central locking, manual air conditioning, power windows in front and some other features like tilt and telescopic steering, Bluetooth audio system, back seat folding up to 100%, 15 inch wheels fully covered. The next trim level is trend which again supports petrol and diesel engines. It has a height adjustable driver seat and audio controls on stereo, ABS, full power windows and rear defogger. The ecoBoost engine is available in Titanium and Titanium optional trim levels. The Titanium trim offers a six speed automatic transmission in the petrol engine variant. The other features these high end models will have are reverse parking sensors, 16 inch alloy wheels, automatic AC. Convenience features like cooled glove box, SYNC system will certainly add ease and comfort to this new car. 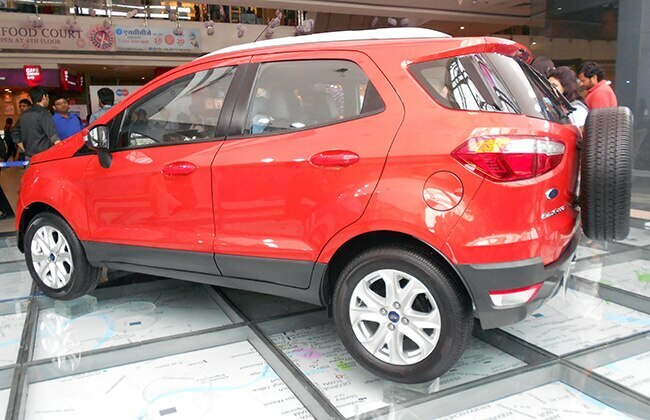 The American car manufacturer has released Ford EcoSport videos and the SUV in red looks powerfully urban and stylish.